"Of all the great players I have coached, Donovan, I think, has a chance to be a first-ballot Hall of Famer," Mornhinweg said. "I really think that. Are we sure that Chris Clemons was the only Eagle that needed to go to the hospital this week. Somebody should check on Marty. McNabb is a great quarterback, no argument here. McNabb is the greatest quarterback in Eagles history, no argument here. First ballot hall of famer, I think not. But let's not pick on McNabb here. It was just Marty being Marty. As head coach of the Lions Marty decided to take the wind and kick to the Bears after winning an overtime coin toss. The Bears kicked the game winning field goal on that opening OT drive. On his decision to punt in OT Marty said, "The people who were there and know all the information ... know that it was the right call. It was the right call then, it's the right call now, and it's the right call 10 years from now." Was a back-up quarterback on the AFL Denver Dynamite when Denver won the first ever Arena Bowl. Philadelphia the city of AFL Champions! Compiled a 5-27 record in 2 years as head coach of the Lions. Such a record didn't keep Marty from saying "I'll be a head coach again"
On how to win in the NFL, Marty said, "There's no excuses in this league. Snap, hold, kick." Marty thinking that Mike McMahon was a starting NFL quarterback. Marty thinking that Mike McMahon was a NFL quarterback, period. Watch out for Marty when he gets mad, "I try not to show it, but I am hacked off, hacked off." Marty was so disgusted with a Lions practice performance he walked out of practice, jumped on a Harley and drove off. 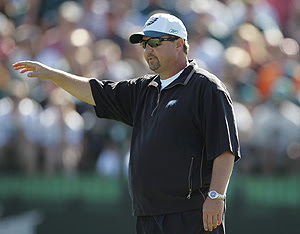 Quick somebody get Andy Reid back on that diet. If anything happens to Big Red, Marty is next in line. All kidding aside, Marty is a pretty damn good offensive coordinator...just keep him away from head coaching duties!